Music Therapy is the clinical and evidenced-based use of music interventions to address and achieve non-musical set goals. Music and the creative practices involved are used therapeutically (performed by a HCPC registered therapist) to improve a client’s health and can be used to assist in various capacities, such as helping with physical, psychological, cognitive, behavioural and/or social functioning. 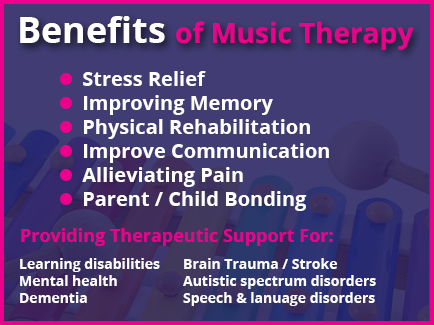 Music Therapy is a well-established allied health profession similar to occupational therapy, speech and physical therapy. Music is a powerful medium which plays an important role in our everyday lives. Unlike other ‘talking therapies’, Music Therapy allows a client to engage in a musical dialogue where they can communicate and express feelings in a supportive environment. Music has the power to reach everyone regardless of illness or disability and our ability to respond to music is usually unaffected by disability, illness or injury. Music therapy is a powerful and non-threatening way to provide extremely unique outcomes for individuals. Evidence supports that Music Therapy interventions can promote wellness and improve the quality of life for people of all ages, regardless of musical skills or background. 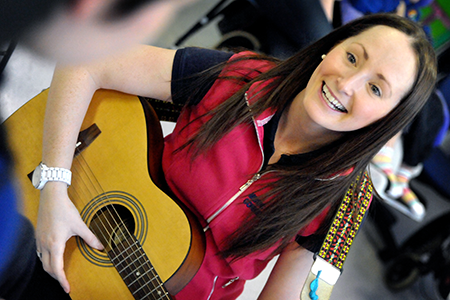 Through Music Therapy: Relationships can be built, confidence enhanced and physical conditions alleviated – all of which contributes to a more positive and better quality of life. Music Therapists usually conduct a 3 week assessment to evaluate areas of need strengths and weaknesses. These assessments, along with intake information and evaluations by doctors and other health care professionals, are critical in determining if music therapy is an effective method of treatment for the patient. The assessment includes potential goal areas and objectives, along with recommendations for session frequency and length of treatment. Based on the results from the initial assessment, Music Therapists set SMART goals. Specific to the needs of the client, measurable attainable goals are outlined which can be achieved within the allocated time. Music Therapists also work in collaboration with other health care professions associated with the client in order to offer the most holistic treatment plan. Clients may be referred to individual or group sessions based on the results from the initial assessment. Placement in these treatment categories is based on the needs of the client, and the types of goals determined to be of the most immediate need. Sessions usually last anywhere from 30 – 60 minutes depending on the needs of the client. All progress is documented following sessions and is used to evaluate the effectiveness of interventions and make decisions for future Music Therapy sessions.